There are some rock musicians on the European scene whose names turn up pretty regularly when checking out new releases or reading press articles. Two of those names are Mat Sinner (bass player, producer etc) and Alessandro del Vecchio (keyboard player and sound engineer). Both are members of Voodoo Circle, the German band that released their fourth album, entitled “Whisky Fingers”, through AFM Records on 27th November. 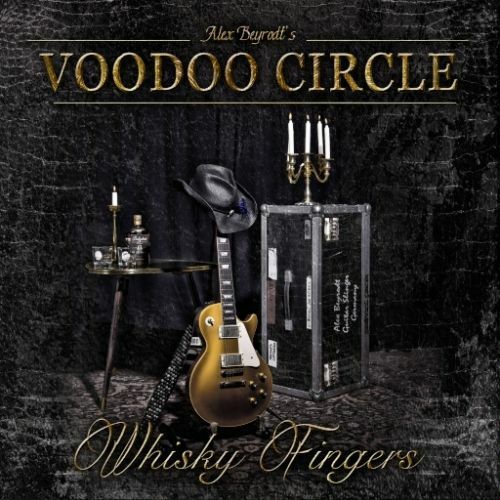 I can’t recall them being involved in a project that I haven’t liked and the latest Voodoo Circle release certainly wasn’t going to change that; built as it is on the excellent guitar playing of Alex Beyrodt and amazing vocals of David Readman. Voodoo Circle was initially founded by Silent Force guitarist Beyrodt back in 2008 and was initially seen as a solo project before developing into a proper band. Mat Sinner was involved in the project from the start along with vocalist David Readman. Listening to Readman it’s impossible not to make comparisons to David Coverdale! The latest additions to the band are del Vecchio and drummer Francesco Jovino. Beyrodt, Sinner and del Vecchio are all also members of Silent Force; whilst Sinner, Beyrodt and Jovino are all members of Primal Fear (who release a new album early in 2016). I’ve played some tracks from the second Voodoo Circle album “Broken Heart Syndrome” (2011) on the NI Rocks Shows over the last few years. The third album “More Than One Way Home” was released in 2013. There are 11 tracks on the latest album, including the single “Trapped In Paradise” for which a video has been recorded. That track is included on the Friday NI Rocks Show on 4th December . Other personal favourites include “Heartbreaking Woman” (which was on the Friday NI Rocks Show on 20th Nov), “Straight Shooter”, the ballad “The Rhythm of My Heart” and “5 O’Clock”.